Developed by a former NASA scientist (and they are super smart!) A/C Re-New is a patented product with proven technology to revitalize your Air Conditioner. A/C Re-New decreases the friction in your compressor, quieting loud noises and reducing the wear and tear on your HVAC system! Ask for A/C Renew at your next maintenance appointment! Adding A/C Re-New on your next maintenance appointment only takes our techs 30 minutes, and the benefits to your system are tremendous. If your air conditioner equipment is over ten years old, you will see an improvement in cooling, lower energy bills and less noise from your AC unit. Did you know older AC equipment is 2—30% less efficient than new systems? Immediate electricity, noise and temperature reduction! Do you have an Air Conditioner Noise? A/C Re-New is injected into your system and mixes with the systems existing oil and refrigerant to reduce friction, wear and noise in the compressor and improve the function of your air conditioner. One of the ways it does this is by removing the oil-based deposits in the refrigerant lines increasing the amount of coolant and decreasing the stress on the system. The result in an improvement in the heat transfer of your air conditioner by improving the system’s ability to cool the air as the refrigerant absorbs the heat from the air as it blows over the coils in your system. A/C Re-New renews the existing oil and refrigerant in your system and increases the performance of the system’s ability to cool the air and lubricate the compressor. The more heat the refrigerant can absorb, the cooler your air will be! Ask for A/C Renew at your next maintenance appointment! Typical results or an average (2,200 sq. ft. house, 5-10 SEER unit, running Mar-Oct) were $240 is the very first year. Savings of $1,200 after five years and $2,400 after ten years! Adding A/C Re-New to your system also reduces emissions and approximately 1,700 KW hours of energy savings in a year! You also save money by prolonging the life of your system. Homeowners also experienced fewer maintenance issues and a cleaner system in general! Let Bill’s Heating & Air Conditioning renew your Air Conditioner, increase the efficiency and extend the life of your equipment. 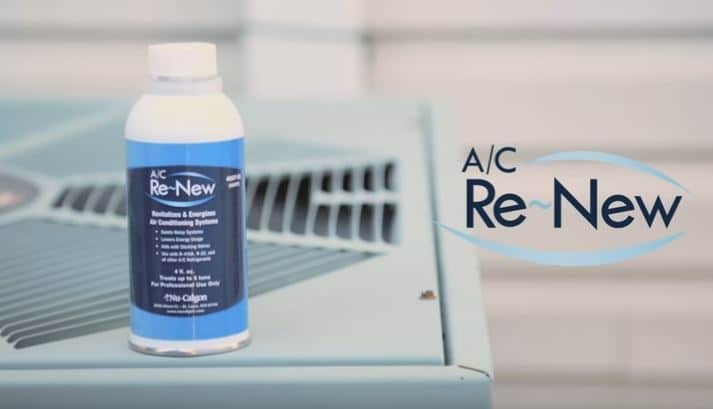 A/C Re-New is designed to increase the efficiency of your Air Conditioner by working with your systems existing oil and refrigerant to give it new life! Your air conditioner will blow colder air. Your compressor will run quieter. You will enjoy an increase in comfort and efficiency and spend less money on your air conditioning bills. The patented technology been used in the marketplace in the car industry and with five years of independent testing and satisfaction is guaranteed. Bottom line, the decision to add A/C Re-New and contact Bill’s Heating & Air Conditioning is a safe and sound one! Ask for it at your next maintenance appointment!